Ahh…summer. What’s not to love? The kids are out of school, the days are longer, and the living is, quite simply, good. But before too long, if your home is anything like mine, boredom begins to set in. This makes summer the perfect time to tackle some projects around the house. 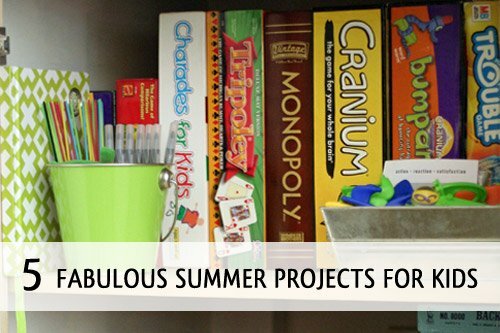 Plus, if you choose one of the five projects on this list, you’ll make having your kids home for summer a notch easier and a bit more organized, too. 1. Artwork and schoolwork. Chances are pretty good that if you’ve got kids, you’ve got some paper clutter somewhere. This problem definitely gets better when the kids get older, but in the mean time if you find yourself swimming in finger paintings and noodle art, now is a great time to take action. 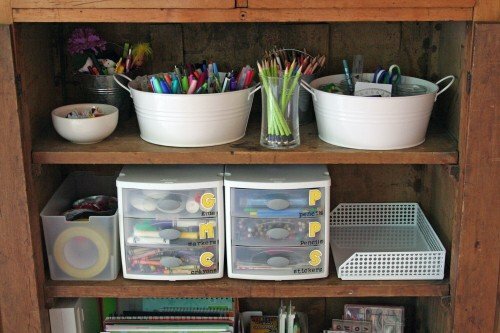 Corral your kids’ art pieces and school work together in a bin, and then let your child select his favorites from the past year. Mom, you can pick out some of your favorites, too, but I encourage you both to resist the temptation to keep everything. The fewer items you keep, the more special each item becomes. Store your keepers in 3-ring binder, storage bin, or file folder. 2. Craft area. Young kids can help declutter broken crayons and pencils, and they can test for dried out markers. 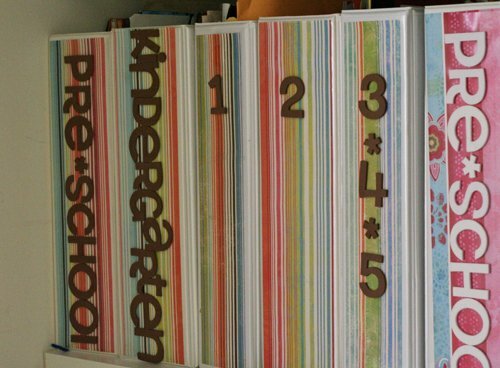 Enact some kid-friendly storage solutions. Consider corralling supplies onto a turntable outfitted with metal buckets, or use small plastic drawer units to contain everything from craft paper to paints and markers. The bonus for getting this area under control is that it makes it simple for kids to do some art projects on rainy or “I’m bored” summer days. 3. Game cabinet. If your kids have outgrown Go Fish and Candyland, summer is a great time to cull through the game cabinet and create some order. Let go of games that are missing parts and those no one enjoys playing anymore. 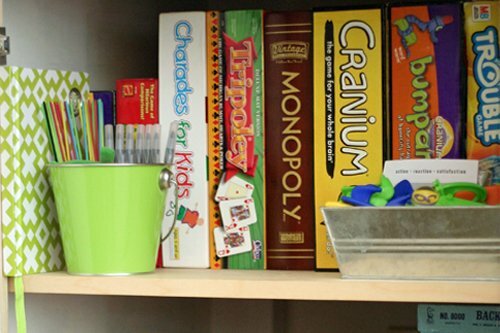 Keep favorite games in easy to access areas to encourage unplugged playtime and easy clean up afterward. 4. Outdoor gear. Organize outdoor gear such as favorite yard toys and bubbles, or sports gear and bikes for older kids. 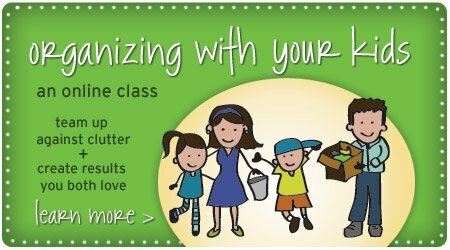 Again, focus on letting go of items your children no longer use, as well as broken and outgrown items. Corral like items together and store gear in buckets or bins on shelves in the garage or utility room. 5. Hangout area. Where does your child spend most of his or her indoor time during the summer? Give this favorite spot some TLC with a quick decluttering and organizing session. Make sure to assign specific and easy to access homes for favorite and frequently used items like toys, books, and games. Why are these five projects fabulous? Because not only will they keep clutter at bay, but they’ll also set your child up for an easy, fun-filled summer. A win for both of you, don’t you think? What projects are you planning to tackle with your kids this summer? I’d love to hear your ideas in the comments! My daughter has a plastic drawer unit for her craft stuff. It works great to keep all her craft supplies together. We go through it regularly to declutter it and remove broken and unused items.